Accompanied by this brilliant cartoon he drew for it, MadPriest published this as a guest post a few days ago. I hope you find it interesting. After the debacle in Vietnam, Bill Moyers wrote an interesting and introspective analysis of the White House decision-making culture. The need to be in the group, to be a part of the culture and not be a problem for it, overrode judgement. Even though White House staff individually knew the bombing campaign against North Vietnam simply was not working, the need to be part of the inner circle led to recommendations for more bombs. The ongoing deaths of US military personnel and Vietnamese civilians did not move them to change tactics. When anyone finally broke ranks, resigned and said what everyone else knew, that the bombing was not working, the members of the group found it easier to attack that person than to face the facts. Which leads me to think of two groups. One group is very small and prophetic; the other is steadfastly loyal to the inner circle. 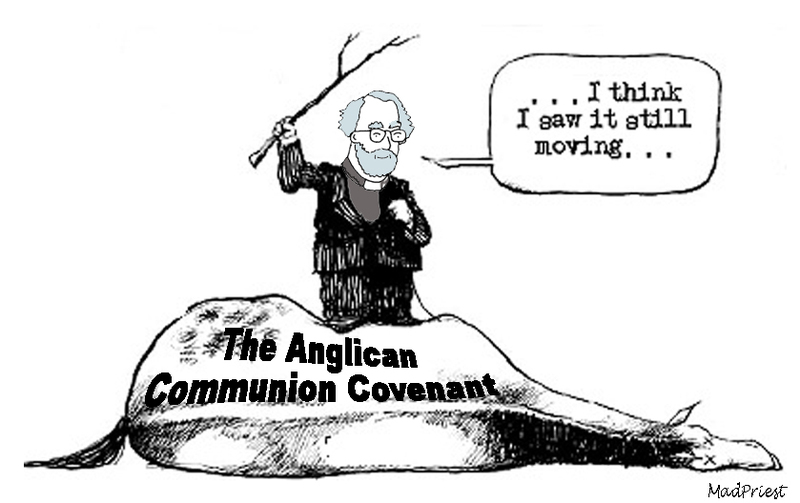 Two English bishops have become Episcopal Patrons of the No Anglican Covenant Coalition, placing themselves outside the circle of institutional Covenant supporters. (See link.) Bishops Saxbee and Selby are now at risk of being slurred and isolated. Their action took courage. We also know that several of our brave clerics have given up any hope of advancement to the House of Bishops by being in the Coalition. Groupthink mentality is very hard to escape. Moyers is a powerful intellect, and even he was not able to do so for quite a while. So the persistence of other group, the Lambeth staff, English House of Bishops, and the lay leadership that continues to promote the Covenant, is hardly surprising. We hear that there are members who know the Covenant is a multi-dimensional failure. They know it won't be universally adopted and will not therefore bring the Communion together, let alone keep it together. The covenanted Church will become hugely litigious. But they do not speak up; they do not resign. They stay in the inner circle. It is safer there. The group thinks well of them. Jesus was not an insider. He did not take the safe path. He demanded justice from the powerful. Likewise, Nathan demanded justice from David. Throughout the Hebrew Scriptures, it is those who demanded justice who are remembered as prophets, those who spoke for God. When Jesus is recognized as a prophet in the Gospels, it is because he calls for justice and does not bow to mere rulers. Do I think I know two prophetic bishops? Yes. Do I know some prophetic priests? Yes. It is difficult to fault those who stay in the circle of power. After all, they are doing their jobs and supporting their archbishops. But it is relevant to note that history has sided against every single point made by those who called the first Lambeth Conference intending to rebuke a prophetic bishop. History largely forgets those who play it safe. For those in the inner circle, for the archbishops who demand yes men and women, that is something to think about. So far, I´m pleased to note, that there have been no ¨excommunications¨ for disagreement and/or ministering to those who suffer at Church/beyond (I mean really suffer as in the murder of Anglicans like David Kato in Uganda and dozens of others in blood drenched Jamaica)...browbeating, no doubt, long unruly ones, crafty crossed Rowan ones, but nothing matches the nasty whipping by excommunication delivered home by Archbishop Orombi/Uganda (and cancellation of retirement pension) for Bishop Christopher Ssenyonjo...Bishop Ssenyonjo was counseling ¨the Gay¨-- certainly a ¨consequence¨ like one ought imagine/project for those who ¨sign up¨ to the Anglican Covenant. Thanks be to God that Bishop Christopher attended the burial of Anglican David Kato as the Anglican clergyman who officiated started a near anti-LGBTI hate riot as he demonized ¨Gay¨ people during the funeral...Bishop Christopher calmly took over and accompanied the coffin to the burial site and put beloved David into the ground...excommunicated by Orombi or not, Anglican Covenant or not many Anglicans know the difference between right vs. wrong (mostly) at Church/beyond.